iPhone X Battery Case - External Battery Backup Protective Charger Case for iPhone X - 4 LED Indicator Lights. *4 level indicator lights that let you know exactly how much power you have(25%-50%-75%-100%). *High polylium material to protect your iPhone.Charging and Protecting 2 in 1. *Not include light cable,use your iPhone lightning cable to charge the battery case. 1.The battey case ONLY suit for iPhone X(5.8 inch),NOT fit for iPhone 8/7/6S/6(4.7/5.5 inch). 2.Item not compatible with iPhone lightning headphone or traditional 3.5mm headphones.Only works with Apple airpods or other wireless bluetooth headphones. 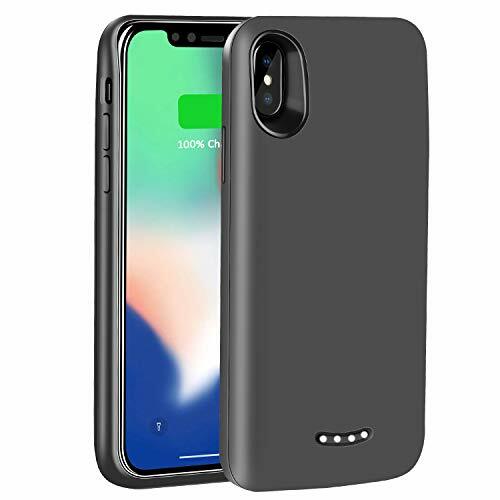 [APPLICABLE MODEL] Tech Care 6000mAh iPhone battery case ONLY fits for iPhone X 5.8 inch,NOT compatible with another iPhone model.Just input your existing iPhone lightning cable then you can charge your battery case and iPhone simultaneously. [NO EXCESSIVE BULK DESIGN] Soft silicone frame protect the lightining port from damage,only adds 0.18 inch and 5.3 oz to your phone with no excessive bulk,excellent protection case get it in hand more comfortable. [DOULE YOUR BATTERY LIFE] The powerful 6000mAh built-in polymer adds more than 200% extra power battery life to your phone with providing an extra 38 hours talking time,25 hours internet use,9 hours gaming to your iPhone X. [SAFE CHARGING] Tech Care iPhone X battery case adapt intelligent power IC protect your device against over-charged,over-discharged,over-voltage,over-current and short circuit charging accidents. [100% MONEY BACK GURANTEE] If you are not satisfied with Tech Care iPhone X battery case,please let us know and you will be offered a full refund and replacement.Enjoy this absolutely risk free purchase by clicking the yellow Add to Cart button. If you have any questions about this product by Tech Care, contact us by completing and submitting the form below. If you are looking for a specif part number, please include it with your message.